Have you ever seen someone sporting the latest and greatest in technical wizardry—perhaps they are very proud of their new iWatch—but you are unimpressed by it? Sure you have. You have also seen someone sporting the latest and greatest in technical wizardry—perhaps in 2007 you thought this about the brand new product called the iPhone—and you thought to yourself, “that really solves a problem I have; I need that.” What differentiates those two types of products? What can a producer do to ensure customers have the latter reaction, and not the former? I call the distinction Innovation Motivation, and it is described well by Shlomo’s Innovation Motivation Matrix (IMM). The IMM shows how customers react to different types of innovations. Horizontally, we have two different types of motivations for innovation: The innovation being introduced can be motivated by the wish to help the customer, or by the desire to use new technology. Vertically, we have different degrees of novelty being introduced in the product: Either low novelty, which represents incremental improvements to existing products, or high novelty, representing dramatically different capabilities. When the producer introduces new products with low novelty and motivated by the desire to adopt technology, as depicted in the lower left quadrant, the customer is puzzled. Who needs a toaster with an internet connection? Of what use is a coffee machine that snaps a photo each time you load it? These products fail to connect with the customer because they are conceived without the customer and deliver no special benefit. 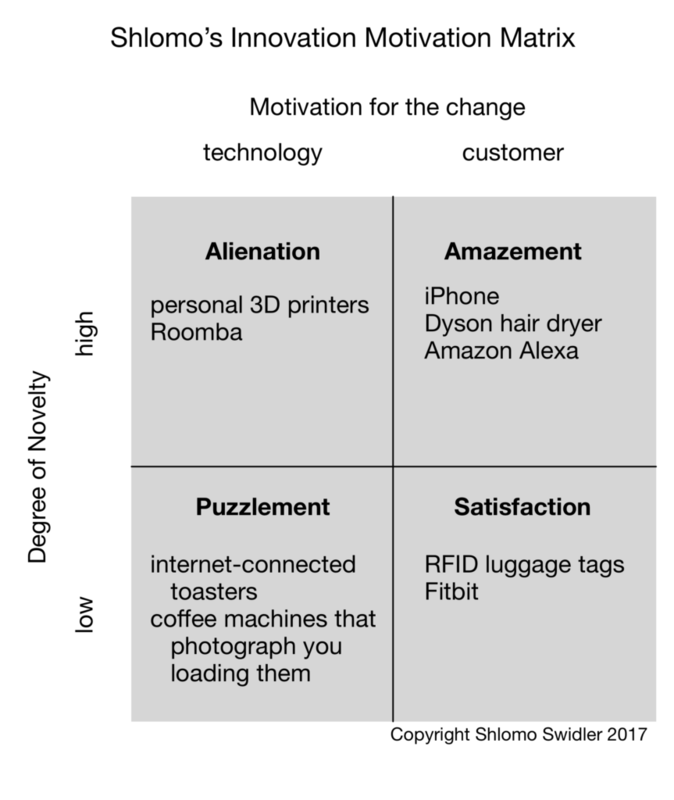 In the top left quadrant, the company introduces great novelty, but for the sake of the technology, not the customer, and the result is customer alienation. Personal 3D printers might be technologically new and cool, but they are (as of today) hardly useful for the general public. Roomba, the giant hockey puck that autonomously vacuums the floor, is amazing technology, but in every household I’ve seen it, it sits in a corner gathering dust once the novelty has worn off. It’s not very useful, the customer regrets spending money on something so cool that quickly becomes so useless, and so they feel alienated from the company, unlikely to buy anything from them again. But when the company focuses on the customer in developing new products, great things can happen. At the very least, the product will offer satisfaction, shown in the IMM’s bottom right quadrant. RFID-enabled luggage tags are an incremental improvement to the traditional luggage tag, and they deliver great benefit to the customer: reduced anxiety about, and incidence of, lost luggage. Fitbit is not very novel, but customers love tracking their vitals and challenging themselves to meet fitness goals. At the best, when the customer is the focus and the novelty is high, the product can deliver amazement. 2007’s iPhone was truly revolutionary, and everyone had to have one. The Dyson hair dryer is orders of magnitude better than the standard appliance, and worth the matching price tag. Amazon’s Alexa is a completely new class of device, and it delights customers with its ability to orchestrate so many elements of the household. The lesson for product companies is clear: Focus on the customer, not on the technology, in your innovation. The early 2010s saw many software companies avidly adopting cloud computing—a technology—for its own sake, without pausing to consider why the customers would care. Predictably, these companies failed to impress customers and sank into irrelevance. The product label or advertisement contains jargon or three-letter-acronyms (TLAs). You can’t explain why customers will continue to use this product a year later, after the novelty wears off. The customer’s emotional state is not altered significantly by the product. Customers have not been involved in the product design and development. Where do your company’s products fall on the IMM? What motivates your product development efforts, and how novel are they? Answering this will help you discern what you need to do to satisfy and amaze your customers.